India’s diamond jewellery export is likely to see a rise in the coming months due to indications of revival in the economies of America and China, which together constitute two-thirds of global jewellery consumption. Gems and jewellery export fell 8.7 per cent during the first nine months of the current financial year to $25,076 million (Rs 150,257 crore) from $27,465 mn (Rs 149,955 crore) in the corresponding period last year. “We expect a slight strengthening in growth in diamond jewellery demand in 2014, driven by continued gradual improvements in the global economic outlook. The US and China are expected to continue to be the main engines of growth for polished diamonds. Most other markets are expected to show positive growth in local currency, with final dollar-denominated results being partly dependent on currency fluctuations,” said Mark Cutifani, chief executive of Anglo American, the parent company of De Beers, while presenting financial results of the company on Friday. “That was the scenario in August last year. Things have changed significantly and banks have started looking at diamond processing with a positive outlook. In fact, a couple of banks have started calling upon companies with a fair record for lending. 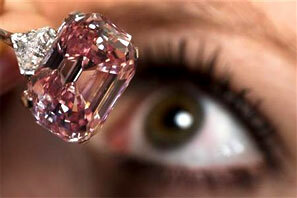 Hence, working capital is no long an issue,” said Vipul Shah, chairman of the Gems & Jewellery Export Promotion Council. De Beers, the world’s premier source for rough diamonds, has painted an attractive picture for jewellery demand, especially from the US and China. De Beers posted a 12 per cent increase in rough diamond production to 31.2 million carats in 2013, as compared to 27.9 million carats in the previous year. The US market showed positive growth in the fourth quarter. China continued to show positive growth rates but at levels consistent with slower economic development. In the medium to long term, industry fundamentals are expected to strengthen as diamond production plateaus and demand continues to increase, Cutifani added. In India, however, both rough and polished diamond prices have risen by three to five per cent since January, due to the lack of pipeline inventory supplies. According to Shah, liquidity in the diamond jewellery sector has come back to normal after four or five months of squeeze. “We hope for a better year ahead,” he added. The most uncertain factor was high volatility in the rupee against the dollar. Fortunately, this volatility has since stabilised, helping exporters to formulate a long-term strategy.